Sometimes it’s the most outlandish ideas that are the best. In the Financial Times Thomas Palley argues that the world should adopt a minimum wage, based on a fixed percentage (he suggests 50 per cent) of each country’s median wage, which is the wage at which half of workers are paid more and half are paid less. The proposal would work wonders for poverty reduction. Income inequality inside countries is often hidden, as outside commentators fixate on global trends. 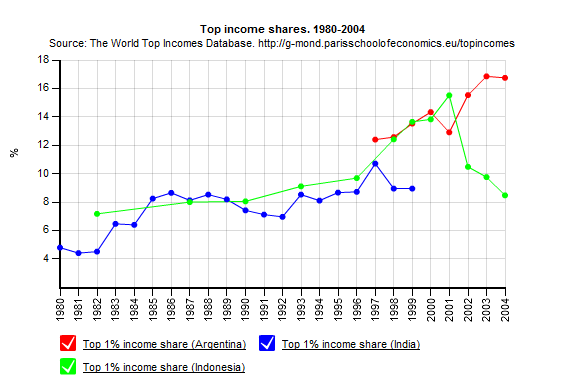 In Argentina, India and Indonesia, for example, the top 1% experienced a boom in their income shares from 1980 onwards. Whilst the data are incomplete, the following graph shows a gradual upward trend for India from 1980 to 1999, and a similar expansion in Indonesia until 2001 (although in the years following the crisis the income share of the top 1% plummeted back to levels of a decade earlier). In India the trend is even more stark: by 2004 the top 1% took home over 16% of the country’s income, compared with just over 12% seven years earlier. These are countries in which poverty remains widespread. Palley’s idea helps address a fundamental shortcoming of global economic growth over the past few decades, which is that it has been disinflationary. Alongside the scare-mongering of American monetarists, and in the midst of a commodities boom, it’s easy to forget that the dismantling of trade and investment barriers and the entry of China and other cheap-labour emerging economies onto the global marketplace have created an unprecedented lowering of production costs at the same time as an increase in supply. Workers around the world have been forced to compete with one another, driving down wages. Add to that financial liberalisation, lax monetary conditions and the consequent explosion of debt, and you have a long-term recipe for disinflation. As a recent IMF paper argued, inequality equals instability: “the large and highly persistent rise of workers’ debt-to-income ratios generates financial fragility which eventually can lead to a financial crisis.” Raising real wages would address this source of debt creation. The infamous global imbalances, whereby China lends to the rest of the world in return for demand for its exports, are partly the product of a lack of buying power. Cheapness isn’t the only route to development, and an increase in Chinese buying power would help rebalance the world economy. Higher Chinese wages would also help ease US worries about the undervaluation of the yuan. …globalisation has increased international labour competition, which has contributed to rupturing the link between wages and productivity growth. That rupture has undermined the old wage based system of demand growth, forcing a turn to reliance on debt and asset price inflation to drive growth. 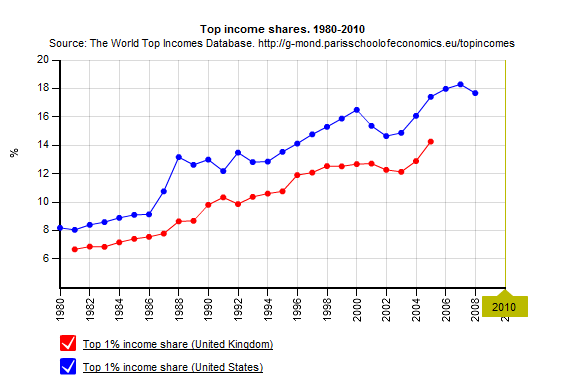 It has also increased income inequality. Restoring the wage – productivity growth link is therefore vital for both economic and political stability. ← Male Organ and Economic Growth: Does Size Matter?